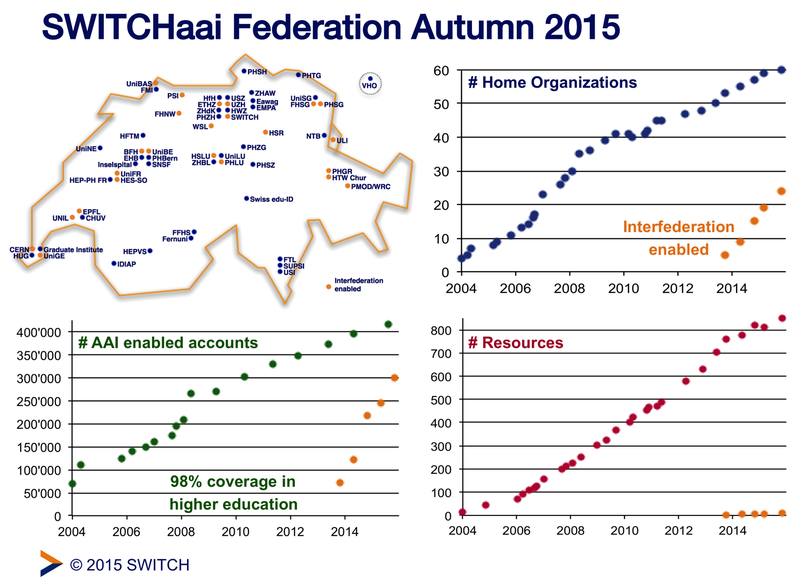 In autumn 2005, SWITCH launched the production service for the SWITCHaai federation. Now more than 400’000 users from 60 institutions have a SWITCHaai enabled account that allows them to access their choice of more than 800 SWITCHaai enabled services. The usage of SWITCHaai is still increasing. Over the last 12 months, an average of 50 logins per minute were counted on the central discovery service, a growth of 6% compared to the prior period. 40% of Identity Providers are now interfederation ready, serving more than 70% of all AAI-enabled users. In early 2016, the US InCommon Federation will also widely deploy interfederation via the interfederation service eduGAIN. The number of users able to access services registered in another federation is constantly growing, which attracts even more services. Currently, however, only nine out of the more than 800 SWITCHaai enabled services accept users from other federations. Since the end of November, there are no longer any SAML1-only Service Providers registered in the SWITCHaai Federation. Now that the SAML2 standard is 10 years old, it is time to get rid of the last few services that still default to using SAML1 even though they also support SAML2. Categories: SWITCHaai | Tags: eduGAIN, interfederation | Permalink.